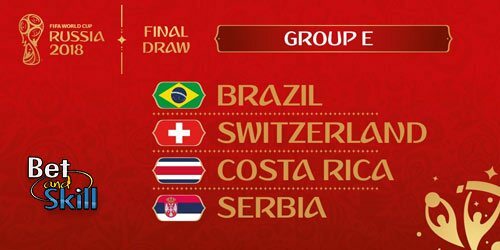 World Cup 2018 Group E consist of Brazil, Switzerland, Costa Rica and Serbia. Check out below our World Cup 2018 Group E betting preview including predictions on Group Winner, To Qualify, To Finish 2nd, To Finish Bottom and Straigh Forecast. 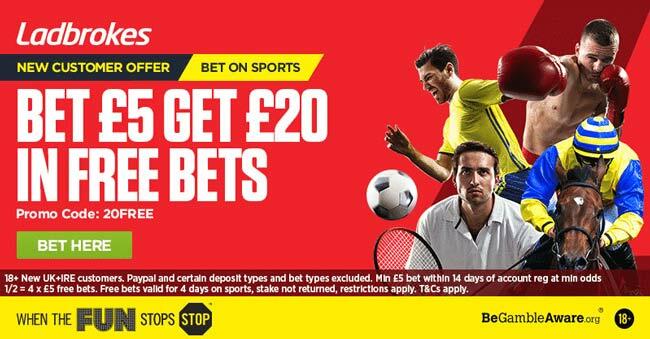 Plus, the best odds, betting promotions and no deposit free bets on Russia 2018! The Russian World Cup is almost here, as a global army of football fans prepare for the most prestigious tournament in football. In this post, we'll take a closer look at Group E and try to determine which two sides are likely to prevail. We start with Brazil, who are currently ranked as the second-best team in the world by FIFA and 5/1 favourites to win the tournament outright. They qualified comfortably after topping their table with 41 points having lost just one game. The Seleçao were sixth with a third of the qualifying campaign gone when journeyman coach Tite replaced former Brazil midfielder Dunga and guided his country 10 points clear of second-placed Uruguay. The last two firendlies, both played last March, saw the Seleçao beating Russia (3-0) and Germany (1-0). Brazil's current team is built on solid defensive foundations, with holding players such as Carlos Henrique Casemiro and Renato Augusto providing a platform on which Tite's creative players can perform. The talismanic Neymar Jr. is almost afforded a free role in a fluid 4-3-3 system, while Barcelona's Philippe Coutinho and Manchester City's Gabriel Jesus also offer plenty of bite in attack. The Verde-Amarela also have history on their side, as the only nation to win five World Cups and compete in every tournament since its inception back in 1930. They also managed to secure fourth place as the hosts last time out and they'll fancy their chances of going further this time round. While Brazil are the clear favourites to prevail in Group E, their closest rivals are likely to be Switzerland. La Nati are currently ranked as the eighth best side in the world by FIFA, and under Vladimir Petkovic they delivered one of the most impressive qualifying campaigns in living memory. In fact, it was only a final day qualifying defeat in Portugal that blemished Switzerland's perfect record, while incredibly consigning them to second place in Group B and a play-off match against Northern Ireland (which they won 1-0 on aggregate). Despite this, Switzerland boast an experienced and talented squad that should be fiercely competitive this summer, with captain Stephan Lichtsteiner and midfield gem Xherdan Shaqiri having made a combined 164 appearances for their country during their decorated careers. The talented Stoke City offensive midfielder Shaqiri and Arsenal playmaker Granit Xhaka are the most representative players of the team. Young Schalke striker Breel Embolo could also be a player to watch this summer, as the Swiss look to improve on a World Cup record that has not seen them progress beyond the second round since 1954. Petkovic has been in charge of the Swiss since 2014 and led them to the last 16 at Euro 2016. Switzerland recently secured back to back wins in friendlies (last March) against Panama (6-0) and Greece (1-0). One of the surprise packages of the 2014 World Cup, Costa Rica will be looking to build on their quarter-final appearance in Brazil four years ago. It represented their best performance at the finals to date, and current manager Óscar Ramírez will surely fancy his chances of making even more history this time around. The Costa Ricans also managed to qualify with relative ease for the finals this time, in a CONCACAF group that provided many twists and turns. Ramirez' men secured second place behind Mexico, while the United States missed out for the first time since 1986., with the highlight being a 4-0 victory over the United States. Last time out in Brazil, they finished top of a group containing Uruguay, Italy, and bottom-placed England, before going out in the quarter-finals on penalties to the Netherlands. The talented 27-year old striker Marco Ureña was the side's top scorer with three goals, while captain Bryan Ruiz and the pacey Joel Campbell (remember him Arsenal fans?) added some genuine quality to an increasingly powerful and experienced side. This will be the side's fifth appearance at a World Cup final, and they'll surely run Switzerland close for a place in the last 16 this summer. The played two friendlies last March, with mixed results - a 1:0 success over Scotland and a 1-0 defeat to Tunisia. We close with Serbia, who are the fourth seeds in the group and currently have a FIFA world ranking of 37. They finished top of a group featuring the Republic of Ireland and Wales but that was enough to save manager Slavoljub Muslin from being sacked. They collected 19 points and leapfrogged Wales at the last fence. New manager Mladen Krstajic is now at the helm for the World Cup itself, with his captain Branislav Ivanovic established as a prominent leader on the field. The current squad also boasts several talented young players, including the 26-year old playmaker Adem Ljajic and Eintracht Frankfurt's attacking midfielder Mijat Gacinovic, who has already scored two goals in just five international appearances to date. Aleksandar Kolarov, Aleksandar Mitrovic, and Sergej Milinkovic-Savic are other talented players of the team. This will be the Eagle's 12th appearance at World Cup finals in one guise or another, the second since they officially became Serbia in 2010. The national side has failed to progress beyond the group stages since 1998 though and will certainly face an uphill struggle to finish in the group’s top two this time around. As to recent international Friendlies, they suffered a 2-1 defeat against Marocco on 23rd March but managed to beat Nigeria 2-0 few days later. The following are the highest odds on the World Cup Group E Winner market. Click on the 'Bet' button to require the highest available odds on your selected team. With Brazil the clear favourites to progress as group winners here, the real fight is for second place. We fancy Costa Rica to edge out Switzerland, with the two set to do battle in a potentially decisive game on 27th June at the Nizhny Novgorod Stadium. "2018 World Cup Group E predictions, betting tips, odds and free bets"